By the time a young actress danced in front of a three-way mirror and on table tops, shaking her body as her bobbed hair bobbed and her scandalously short skirt swayed up and down, the dance known as the “Shimmy” was almost a decade old. 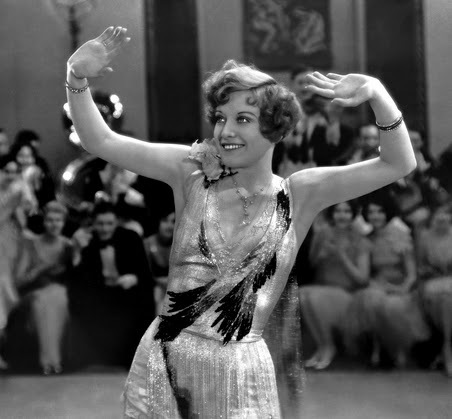 This was Joan Crawford in the Academy Award nominated film, Our Dancing Daughters(1928). Crawford epitomized the flapper-dancer-modern-woman of the Jazz era. She may have brought the popular Shimmy dance to the (somewhat respectable) silver screen, but she also tamed it in many ways. 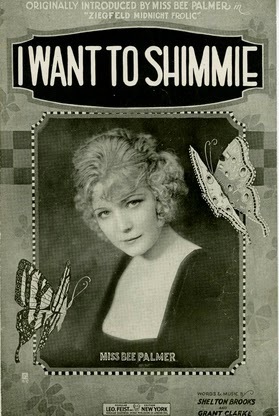 The Shimmy had actually emerged a decade earlier, in the months after the end of World War I. And it caused an uproar. In 1919, as the dance spread from state to state, many tried to pinpoint its origins. One “expert” claimed it arrived in New York City after being exported from somewhere in Africa. Or maybe Cuba. Some argued that it emerged from the “underworld” of New Orleans before making its appearance in New York. 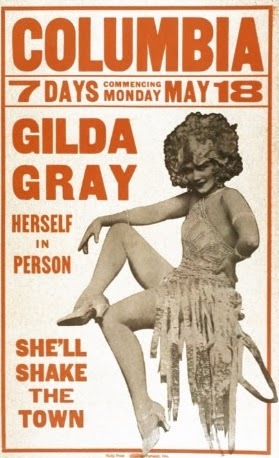 Various entertainers, from Sophie Tucker to Gilda Grey, were later cited as having “introduced” the dance to Manhattan. In 1919, it took little time before people across the country noted that the “purest type of the dance is done in Gotham.” (The Kansas City Kansan, February 17, 1919). “You just do a little syncopated fox-trotting with the young woman. In New York City, the dance was all “the rage” in “the more frivolous cabarets in the metropolis,” The Evening World reported. And authorities were taking note and action. It was not “decent,” she proclaimed, and any dance hall permitting the Shimmy will have its license revoked, she announced. Other government officials followed suit. The mayor of Perth Amboy, NJ, also outlawed it (The Evening World, February 21, 1919). 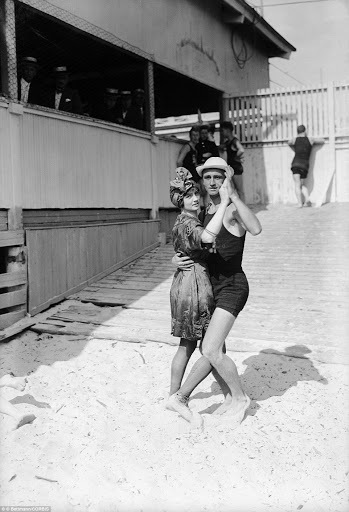 By June, policemen were roaming the “pleasure capitol,” Coney Island, entering dance halls and looking for anyone who danced with “modern steps.” These people were summarily thrown out. With the passage of the Volstead Act, drinking would go underground in January 1920, when prohibition went into effect. Coincidentally, just 8 months later, the 19th Amendment was ratified. Women could now vote. A Line in the Sand: That’s too close! The gangs of police and moralizers now went in search of all kinds of lawbreakers (indecent dancers, drinkers, and women of “ill repute”) that could be found in dance halls. Indeed, officials noted that the dance halls were populated by “public women,” to use the term of the day, (aka prostitutes) who passed themselves off as dance “instructresses” who would teach men to dance the Shimmy for 25c (they also taught other scandalous dances including the “Hootchi-Kootchi” and the “Cheek to Cheek”) . The outrageous moralist Reverend John Roach Straton, outspoken pastor of the Calvary Baptist Church, tasked himself with going undercover to investigate what he believed to be the destruction of the city owing to immorality and vice. Along with several unidentified “helpers,” he visited several dance halls on the Upper West Side. There he was aghast not only to see highballs and whiskey straights being served openly, but dances that made him sick with moral outrage. 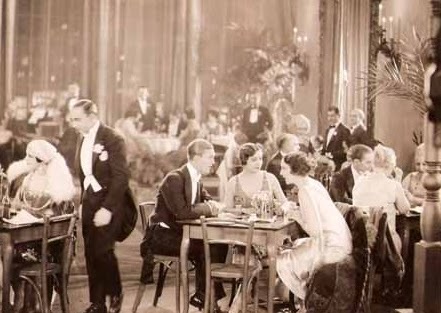 The “dancing was,” he proclaimed, “disgusting.” Men and women sat at tables around the crowded dance floor, he reported, “many of whom were in indecent posture and were indulging in indecent familiarities.” Occasionally, he noted, women would “make special exhibition of vulgar dancing” in front of his table! All in all it was a horrific night witnessing “sinful amusement.” “[T]he wastage of the young life of this city is tragic and heartbreaking,” he declared after sermonizing on the subject. (“Dr. Straton Tells of Buying Drinks,” New York Times, April 5, 1920.) In 1923, Straton would launch his own radio station to broadcast his sermons against the “devil” in the city. At places such as The Palm on Chrystie Street, Billy McGlory’s Armory Hall at 158 Hester Street; Fatty Flynn’s Dance Hall at 34 Bond, the Terrace Garden at 58th and Lexington, and the Bay Ridge Assembly, at 50th Street and Fifth Avenue, the threats of closure were palpable. No longer able to serve cocktails, the proprietors also faced threats from undercover spies looking to spot the Shimmy and bring doom upon the once happy “pleasure” palaces. His answer was, in essence, “Yes.” But in order to pretend that he was objectively seeking to answer his own question, he too ventured around New York City to see for himself just how steep America’s decline was. He hires a “guide” to take him on a tour of the hottest dance places in the city. “The dancers wiggled, jiggled and hopped about. Hardly two couples danced alike. It was a free-for-all, every hold permissible and no referee to break clinches. 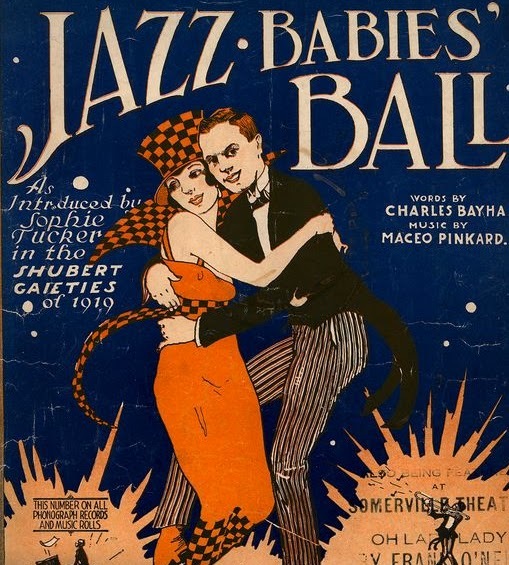 My experts assured me that most of the dancers were quite untutored and unregulated; they did what they pleased; anybody without previous experience could hop onto the floor and do as well or ill.
Perhaps that is the charm of the jazz. It is anarchy in the dance. However, there were two predominant motions. One was horizontal and the other was vertical. The first came under the category of shimmy, while the second appertained to the toddle. To my surprise I noted a simultaneous combination of vertical and horizontal motion, as Professor Einstein might term it, together with a relative degree of gyration. The performer had bobbed hair and a salmon smock with a blue sash. 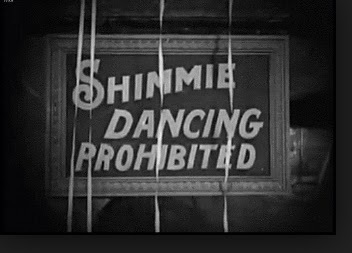 Soon, the Shimmy was pervading popular culture, ban or no ban. 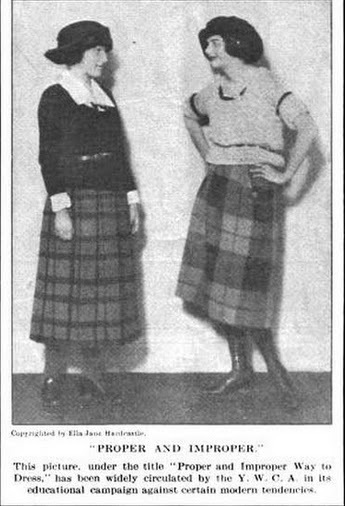 In an essay titled “Home Again,” (Good Housekeeping, September 1919), the actress Elsie Janis reported that she had noticed the “shimmy” craze in New York City upon returning home from volunteering to entertain troops during the war. Janis was one of thousands of American women who had gone to Europe to work for the war effort. They returned to a new country, in many ways. And they themselves had also changed. Elsie Janis: “The Sweetheart of the AEF,” entertained troops during the war. Janis, who had been working in Manhattan as an actress for many years before going overseas, regarded the new dance as part of the liberation of women. 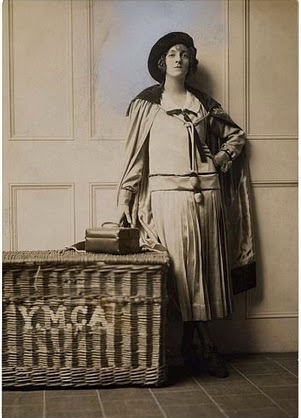 Its emergence also accompanied a new trend for women: the beginning of being freed from the mounds and yards of heavy skirts and long hemlines of the prewar era. In order to Shimmy, it seemed, one needed to stay light. A lot of skin as white as milk. Indeed. The clothes. The newly enfranchised women were not only dancing scandalously, but they were doing it wearing scanty clothing. What would women want next? This indecency had to stop. And it had to stop now. 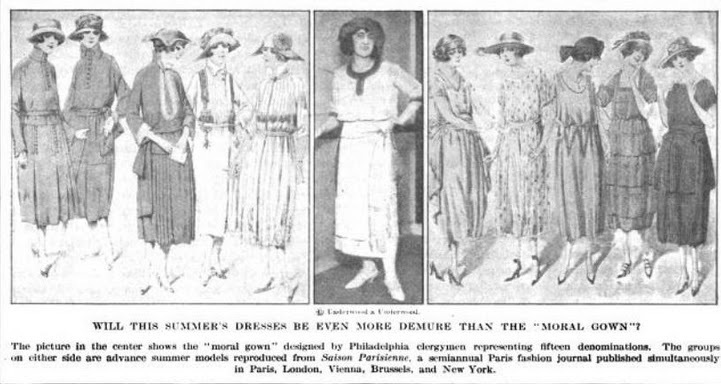 Along with the bans on the dance, there was also a widespread effort to restore “decency” to women’s fashions, much the same way films came under fire for their indecent story lines. But the younger generation, tired by war, looking to create new meanings in a world that seemed to have changed irrevocably in the war, would have none of it. It seemed only a matter of time before the ban would be lifted (and other more “decent” dances captured the popular imagination, ie the “Charleston.”) But the Shimmy craze marked a moment when a dance captured the desire of a generation to move…forward. That’s it! Follow Me, Boys!